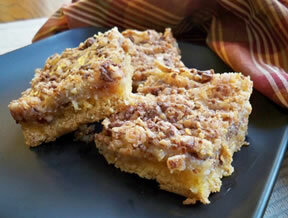 Sweet and delicious gooey bars. 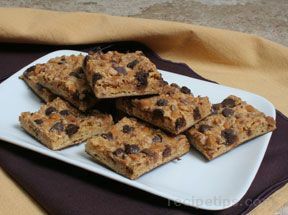 These easy to make bars are made from just a few ingredients but are full of sweetness. Blend the cake mix with the melted butter and 1 of the eggs. Press into 9- x 13-inch cake pan. In a separate bowl, stir the cream cheese until fluffy; then add the 2 remaining eggs and mix well. Add the powdered sugar to the cream cheese mixture and beat until the lumps are gone. 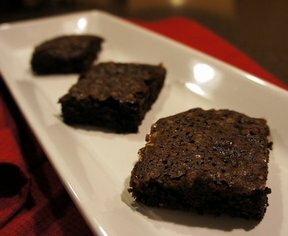 Mix in half of the bag of heath candy pieces; then pour the mixture over the cake layer. Sprinkle the remaining heath candy pieces on top of the bars. Bake at 350 degrees F. for 30-45 minutes or until the top is golden brown. 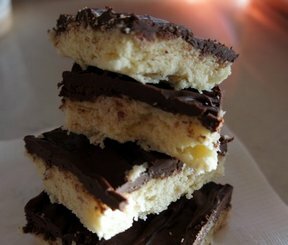 "These bars were really good but I think I could have baked them another 5 minutes. They are named Gooey Bars so maybe that is how they are supposed to be. My husband enough of them so he must not have thought there was anything wrong with them!"